How do I ensure the validity of my K-12 testing program? The US Department of Education requires test security validity evidence as part of the federal peer review requirements. State and district educators can ensure the fairness and validity of test results by keeping tests, test items, and student information secure. Multiple components of test security can prevent testing irregularities, including the prevention, deterrence, and detection of test theft and cheating. What evidence of test security practices does the USED require? How do I prevent testing irregularities? 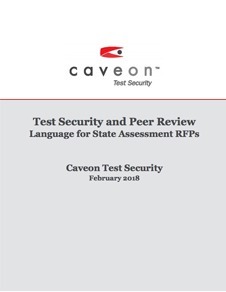 A critical area of test-security preparedness is a review of a local test security policies, procedures and operations by internal or external individuals familiar with large-scale, high-stakes educational assessment programs. This review should include all formal and informal policies, procedures and operational practices against industry best-practice standards. How do I know that my test security policies are effective? Test administration monitoring can be a critical element of an overall test security plan. Monitoring classrooms or other testing sites during test administration can provide valuable information on how and whether test security policies and procedures are being implemented during testing. In addition, monitoring classrooms can serve as a deterrent to inappropriate activities during testing. Data forensics analyses, examining student results after testing has been completed, can serve as quality assurance to ensure that policies and procedures are being implemented. These analyses identify statistical inconsistencies and testing irregularities that are may be indicative of area where procedures need to be developed, additional training is needed, or inappropriate individual behaviors have occurred. Managing testing irregularity reports or other reported incidents is critical to respond to potential breach situations as soon as possible. Caveon Core™ is a secure, Internet-based incident management and reporting platform that can help you monitor, review, and manage test security incidents in real-time. How do I respond to testing irregularities? Testing irregularities need to be evaluated and prioritized for further action. You may decide to conduct test security investigations to review incidents, manage the investigative process when an irregularity occurs, or determine how to triage a test security breach situation. Chief Council of State School Officers. (2013) Operational Best Practices for Statewide Large-Scale Assessment Programs Washington, DC: Council of Chief State School Officers. Olson, John and Fremer, John. (2013) TILSA Test Security Guidebook: Preventing, Detecting and Investigating Test Security Irregularities. Washington, DC: Council of Chief State School Officers. Wollack, James A. and Fremer, John J, editors. (2011). Handbook of Test Security. New York: Routledge.